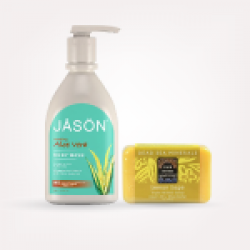 One With Nature Dead Sea Minerals Soap Lilac Description Triple Milled Soap Argan Oil + Shea Butte..
DescriptionBody Wash Aloe VeraThis gentle wash cleanses with natural botanical surfactants a..
Jason Moisturizing Shampoo gently cleanses and replenishes needed hydration to dry hair that’s prone.. Ingredients Aloe Barbadensis Leaf Juice (Certified Organic Ingredient), Aqua (Water), Caprylic/Capr..
Jason Natural Jason Body Wash Lavender ..
One With Nature Dead Sea Mineral Soap Almond Description Dead Sea Minerals Triple Milled Soap Arg..
One With Nature Dead Sea Minerals Bar Soap Blackberry Pear Description Triple Milled Soap Argan Oi..
One With Nature Dead Sea Minerals Soap Dead Sea Salt Description Triple Milled Soap Argan Oil + Sh.. Ingredients: Sodium palmate (saponified palm oil), sodium palm kernelate (saponified palm kernel oil.. Ingredients: Sodium palmate (saponified plam oil), sodium palm kernelate (saponified palm kernel oil..
One With Nature Dead Sea Mineral Soap Lemon Sage Description Triple Milled Mild Exfoliating Bar W..
One With Nature Dead Sea Mineral Soap Olive Oil Description Triple Milled Soap Argan Oil + Shea Bu..
One With Nature Dead Sea Mineral Soap Peppermint Description Triple Milled Argan Oil + Shea Butter..
One With Nature Dead Sea Mineral Soap Rose Petal Triple Milled Argan Oil + Shea Butter Experi..
One With Nature Dead Sea Mineral Soap Shea ButterArgan Oil + Shea Butter Experience the Dead Sea Di..
One With Nature Dead Sea Spa Mineral Soap Sulfur & ChamomileUnique combination of salts + 21..
One With Nature Dead Sea Spa Triple Milled Mineral Soap Vanilla Oatmeal Description Argan Oil &..
One With Nature Dead Sea Spa Mineral Soap Volcanic Mud Argan Oil & Shea Butter Non-GMO Project.. Wet wipes for hand cleaning. A world of care...​SEPTONA Cotton Care wet wipes are ideal for the ..
SEPTONA Wet WipesWet wipes for hand cleaning. A world of care... SEPTONA Cotton Car.. Ears of eyelashes have been rarely missed, and they are called ear traps, but ear ears do not hurt t.. Prevents body odour without impairing the natural function of the sweat glandsSupports and prote.. The Trisoft system of biological ingredients deodorizes and cares for the skin, inhibites the format..
Hand crafted cold process soap. Made from the finest Jordanian organic certified, cold pressed..